Email marketing is an underrated form of marketing campaign, but if used correctly, it can give very good exposure to a new brand. The customers receive a huge numbers of mails every day. They end up deleting most of them without even opening them. What you have to ensure is they open the mail and read the ad or your campaign will not be successful. There are certain tips that you need to follow if you want to avoid such behavior from the potential customers to take your mails seriously and make your appeal a success. Use segmentation and targeting: It is advisable to perform segmentation and targeting before you send them the emails. You must first make sure that the emails fit the choices and interests of the target audience. You can ask your subscribers to update their preferences on monthly or weekly basis or conduct a survey to get an idea of it. Build an engaging template: It may sound shallow, but an attractive design plays a major role in attracting the readers. Make sure that the headline and pre header that you have is clear and concise. Make sure that you highlight the main areas in a way that the readers are able to view it easily. Add animations: A good way to attract more readers to your email is by adding more images and animations to it. Images, videos, gifts, stickers will make your email look more colorful and more people will want to open and read it. Use a welcome email and a goodbye email: When someone subscribes to your blog, you should send them a welcome email telling the customers the benefits that he will get from you. Give him a gist about your next campaign and the discounts and deals that you will give them. When they unsubscribe themselves from your channel, make sure that them a goodbye email. Include a feedback form that will give you an idea what you need to include in your channel to retain more customers. 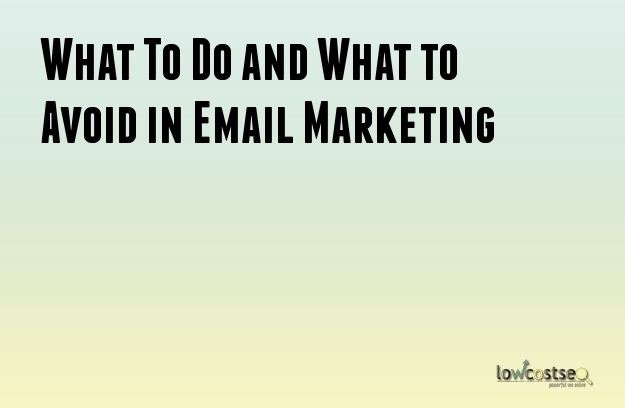 There are dome don’ts that you should remember when going about an email campaign. Don’t neglect the testing: Always make sure that you test the campaigns thoroughly before sending them to the customers. Test the email format, the landing page, tracking, personalization and other elements to make sure that there is nothing missing. Don’t ignore the mobile: Many customers access the email via mobiles. You must also create the emails that are optimized for mobiles too. It is a hassle free process, you just need to get in touch with a software company to get this done. Don’t have too many goals: When you create a campaign, you create it with a particular goal in mind. Settle on one goal during one campaign to make it more concise. Don’t use the cc link: If you have a long list of customers, don’t use the cc tool to send them all. Some customers may hold it as an invasion to privacy.